Along the bumpy road to Borselv I found my niche. I say found, I suspect that I always really knew what and where it was, but over the pot-holed broken tarmac and grey gravel it was confirmed. I like cold, wide open spaces and I like these spaces to have lots migratory shorebirds in them. Cold. Spring is late this year and since I arrived I have been caught in more blizzards than I care to remember. Space. Yes, plenty of that. 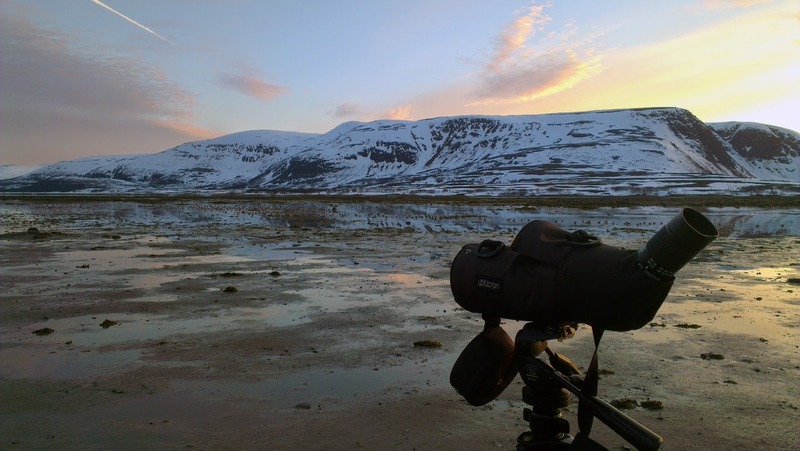 The nearest supermarket to our base is a good 4 hour round trip and our study sites are dotted along the sprawling shores of Porsanger and Lille Porsanger. By the end of our expedition I have driven the equivalent mileage of a trip from Liverpool to Copenhagen and back. Migratory Shorebirds. We’ve just counted 20,000 Knot all in startling summer plumage. Awesome. There is plenty of other wildlife here too; it’s just the vastness, the sheer massive scale of this country that makes Porsanger seem empty. This, I think, is what has me hooked. I like “finding” things here because they are not always immediately obvious as an observer you have to be patient and persistant. Wildlife watching here takes time. I have been lucky enough to spend 10 days in an African jungle and as great as it was, the place and the profusion of life was just too much to take in properly. On every leaf of every branch there was something. A bird, a bug and occasionally a snake. Each one special in their own way, but there was simply not enough time to identify and appreciate them all (and it was way too hot!). Here I can look on a dozen acidic, shallow boggy pools and see nothing, then on the next I will find something. Here this something is A thing not ANOTHER thing. I find a thing on the thirteenth pool. 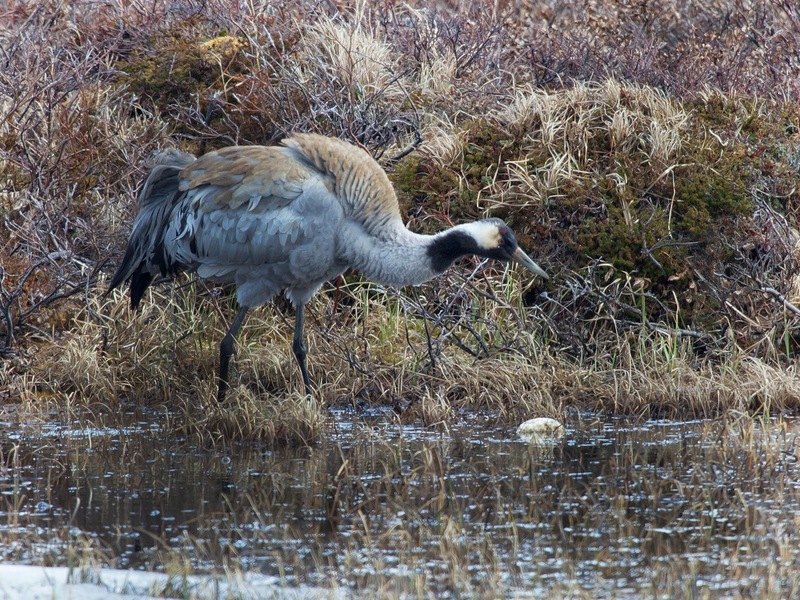 A Common Crane. In amongst these subtle colours I find another thing. 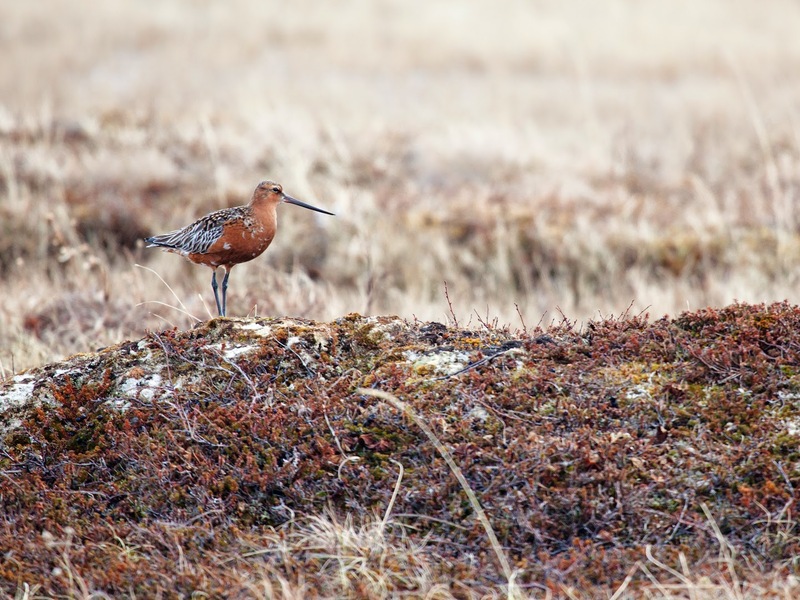 A male Bar-tailed Godwit is defending his territory. This brings home to me another reason why I love it here so much. An awful lot of this wildlife is familiar to me. I see Barwits on the Patch in the winter, never in huge numbers but always there. Here I can see them in their summer plumage. So the wildlife here is the similar, but subtly different. The Barwit’s brown winter speckles have deepened to ruddy red and he looks super smart. There is plenty of stuff here that I would never see on the Patch but, in general, sizes and shapes are equivalent giving me time to appreciate things fully once they have been identified. Now I'm thinking along another track. Am I a lazy naturalist? I like the slow pace of the fjords and my beloved Dee estuary back home. Here days, well daylight, lasts for months and back home everything follows a tidal rhythm. Wildlife is spectacular but it is not as diverse as in other places, so it’s easy to learn what’s about. Am I too idle to learn all the bugs and birds of Africa? Probably. I am thinking. This place, with the peace, solitude and its vastness does that to me. Space to think big existential thoughts (not that I am any great philosopher with much to say about the world, I just think of tiny, insignificant me in it!). Then again, sometimes in the quiet it is pleasant to think no thoughts at all. As I sit by the edge of the fjord, thinking big thoughts then no thoughts, the calm, gentle oscillation of the waves lulls me into a comfortable indolence while I wait for the tide to drop. In a couple of hours I can resume collecting data for the Knot Project that has brought me here, but in the meantime... my mind just... drifts. On a distant hillside I find a thing. Through the telescope I see a bloody stain on the pure white snow. An old reindeer has come to grief over the long winter and its carcass has become visible as the snow slowly melts. 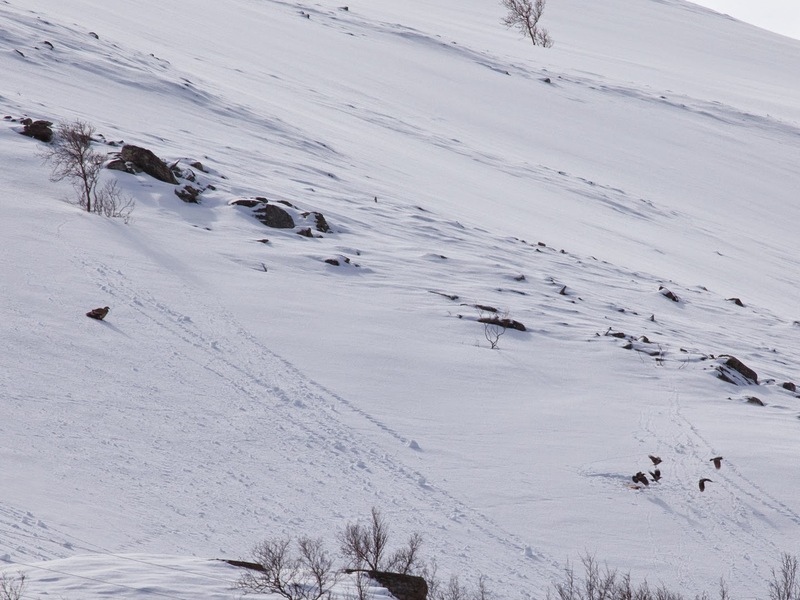 A White-tailed Eagle is pulling at a leg while 5 Ravens wait their turn on the carrion. The eagle takes what it needs then retires to digest its meal while the Ravens squabble over the remains. This environment is often described as harsh or unforgiving and this seems at odds to the way I feel about it. It is just impassive, it can’t forgive because it isn’t sentient, it is mountains and tundra not judge and jury. This place just IS. Another “thing” walks past. 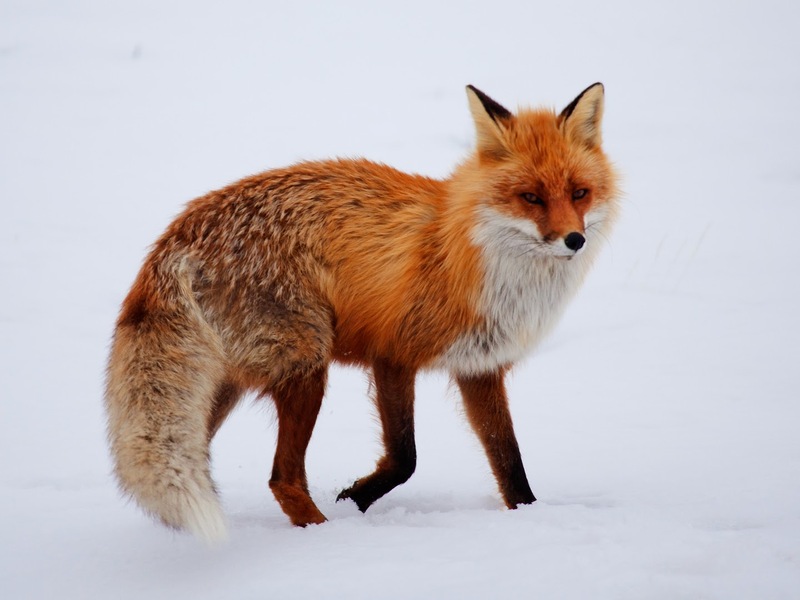 A Red Fox pads through the snow away to my right. It’s coat looking thickly luxuriant and warm. Here they are a bit of a problem. They are expanding their range into that of the Arctic Fox and they are taking the eggs of some rare geese that nest close to here. For all of these problems they are no less beautiful so I reel of a few frames as she (I think it is a vixen) trots by. A shower is coming my way and soon a gentle drizzle starts to fall. The air starts to feel colder too and soon this light rain turns white in an attempt at a snow shower. This low calorie snow doesn’t last long so I just snuggle lower into my parka and wait for the sun to return. I find another thing. A small flock of Snow Buntings (a rare treat on the Patch but a garden bird here) come twittering down to the strandline on the beach I am perched above. The males are in a quite eye-catching summer plumage. They start to forage along the washed up seaweed. This strandline is Himalayan in comparison to the ones we get on the Dee but it fits perfectly with the hugeness of Porsanger. I have taken plenty of pictures of these birds back home but here they are in different plumage and on a different stage. Snow covers the tundra that slopes to this beach and one male hops on to it. 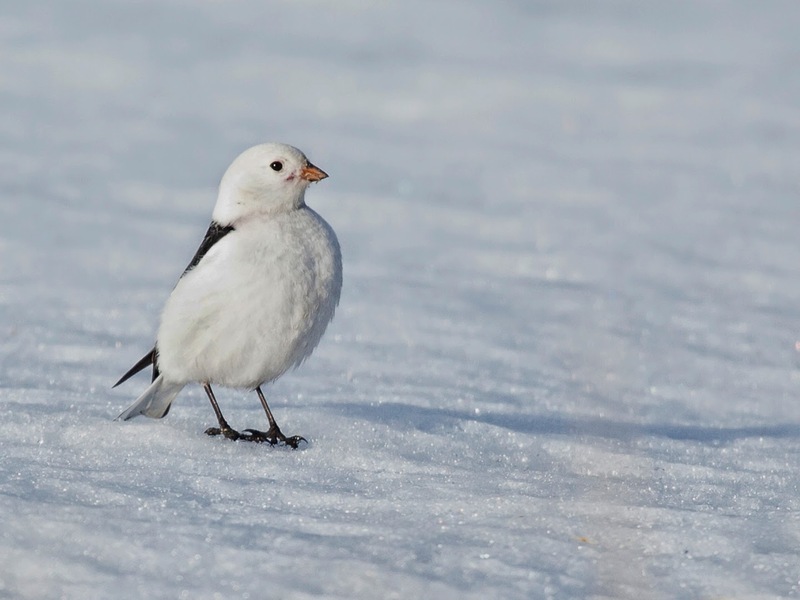 It get to photograph a Snow Bunting on some snow. So in this cold, cold place I feel right at home, warm and fuzzy in my 6 layers of insulation. 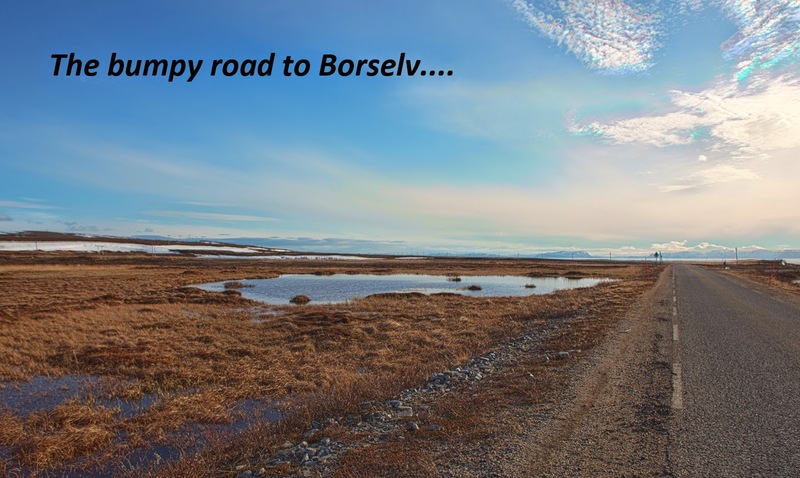 The bumpy road to Borselv is like the muddy banks of the Dee, a home away from home. Nice to hear from you again. I miss your thoughtful passages.